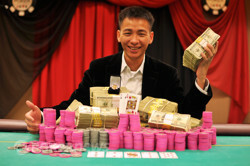 Congratulations to 2011 World Series of Poker Circuit Harrah's Atlantic City Main Event Champion Tuan Phan ($188,830)! 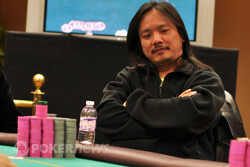 After nearly ten hours here on Day 3, Tuan Phan is the 2011 World Series of Poker Circuit Harrah’s Atlantic City Main Event champion! Phan bested a field of 618 runners, which included pros like Erik Cajelais, Chris Tryba, Chad Brown, Amanda Musumeci, Jamie Kerstetter, and Roland Isra, and eventually defeated Hao Le heads up to win $188,830, the coveted WSOPC gold ring, and a seat in the National Championship. Phan started the day as our chip leader, carried that lead into the final table, and proceeded to knockout seven of his nine opponents entering heads up play. “I am not afraid of anyone,” he told us on the dinner break. Thanks to his fearlessness and a good run of cards, Phan was the first and only player to cross the five million-chip mark. Phan woke up with queens against Mike Devinsky’s jacks, jacks against Larry Riggs’ fives, and hit a killer two outer with deuces against Manh Nguyen after Nguyen had flopped a pair of aces. In the end, it was Phan’s killer aggression that pushed him over the hump and led him to victory. It all began on Day 2, when he won a huge pot against WSOP bracelet winner Chris Reslock. Phan flopped a set of eights against Reslock’s flush, and the board paired on the river. Phan then began steamrolling his opponents, crossing the million-chip mark before night’s end and bagging up more chips than any other player in the field. He showed up fashionably late this morning, but got to work early and often, dominating on his way to victory. 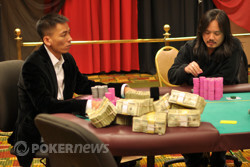 Also, this was Phan’s first ever WSOP event – we’re sure we’ll be seeing him around in the future. Le will walk away with $116,796, which isn’t chump change. He won a monster pot at the beginning of Day 3, flopping a ten-high flush draw against Jeff Fielder’s two pair. There were over 1.5 million chips in the middle, and Le slammed a diamond on the river to make a flush, eliminating Fielder from the tournament. Le later made a 943,000-chip hero call for his tournament life with just a pair of eights. That takes a lot of guts. Unfortunately he fell short in the heads-up match, but there was nothing stopping Phan today. Congratulations are in order for all of these players, but especially for our winner; Tuan Phan. We’ll see you in Las Vegas next May for the WSOP National Championship. Good night from Atlantic City! Hao Le thinks over the decision. Tuan Phan limped from the button and Hao Le raised to 200,000. Phan called and the flop came . Le lead out with 200,000 and Phan min-raised to 400,000. Le took a breath announced a raise to 1,000,000 straight. Phan called and the crowd on the rail rose to their feet. The dealer peeled off the on the turn and Le announced 900,000. Phan quickly announced all in and Le called. Phan was in the lead with his trip threes but Le could take the pot with an ace on the river. Le bricked when a came on the river. After the stacks were counted Phan had Le covered by only 100,000. It's worth noting that Phan scored eight of the nine knockouts of the final table. 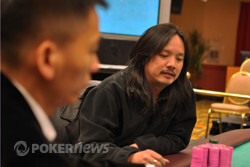 Hand #1: Hao Le called with the button, and Tuan Phan raised to 260,000 from the big blind. Le called, and the flop came down . Phan fired 300,000, Le raised to 800,000, and Phan folded. Hand #2: Phan had the button and raised to 200,000. Le re-raised to 800,000, and Phan folded. Hand #3: Le limped with the button, Phan raised to 260,000, and Le called. The flop was , and Phan led out for 300,000. Le folded. Hand #4: Phan raised to 200,000 with the button. Le folded. Hand #5: Le gave Phan a walk. Hao Le uses raising chips to muscle Phan out. Hao Le started the action by making it 200,000 to go from the button. Tuan Phan popped it to 600,000 and Le called. The flop came and Phan continued out with 600,000. Le took a few moments to measure his action and raised to 1.6 million. As Le was putting his chips in the middle Phan folded and sent 1.2 million of his stack over to Le. There have been very few flops, and a lot of raise-folding thus far. We did see one flop when Tuan Phan opened to 150,000 with the button and Hao Le defended his big blind. The dealer fanned , both players checked, and the turn was the . Le checked, Phan fired 200,000, and Le check-raised to 500,000. Phan tank-folded, and Le took the pot.